Black feminists have moved a big idea that is breaking up the Beltway’s neoliberal consensus. Of all the big stories of this campaign season, perhaps the most severely under-reported is a series of conversations happening just below the establishment surface among progressives in the Beltway. Increasingly, the mainstream consensus is that you cannot address pocketbook issues without also addressing the many realities of race, gender, and sexuality that shape those concerns. Khalid Says: Muhammad Ali Transcended Race? Really? Intersectionality—a theory, analytic framework, and political project advanced primarily by black feminists in the academy for over three decades—has burst out of the insular academic bubble and found life in the belly of the national political beast. And with a presumptive Republican nominee who has gained power by not just by dog whistling but barking racist cues to resentful white voters, it’s not a moment too soon. 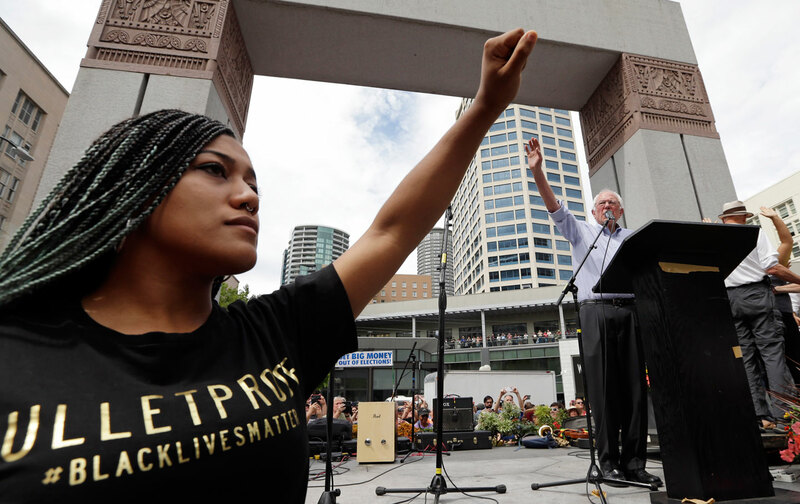 As the “political revolution” and the contest between Bernie Sanders and Hillary Clinton comes to a close, in many ways this moment in American politics represents the final nail in the coffin for the color-blind, race-neutral political strategy of the centrist Democratic Leadership Council—started in the 1980s to move the Democratic Party away from pursuing racial justice while advancing a neoliberal economic agenda. It is worth remembering that Bill Clinton was a central figure in the DLC’s founding and the implementation of its strategy. Now an exactly opposite consensus is forming, one that Hillary Clinton, ironically, will be forced to engage—including, possibly, a repentance for the sins of the first Clinton administration. Political karma is a funny thing. Indeed, as Roosevelt Institute President and CEO Felicia Wong said in her framing remarks for the event: “Trickle down and color blindness started together. The two are linked and they reinforce each other. We must tackle them together.” Amen. There were plenty points of tension and disagreement in this unlikely conversation between the co-creator of #BlackLivesMatter and the co-creator of the popular idea of the 1 percent. But these are the kinds of difficult, yet productive conversations long overdue among progressives. Garza, Harris-Perry, and Stiglitz, each from distinct yet overlapping worlds in the progressive ecosystem, did agree on one thing: the role of movements and organizing. In order for the big idea of intersectionality to take hold as a guiding principle of progressive policy-making, our movements will have to keep demanding it be so. Dorian T. WarrenDorian T. Warren, a Fellow at the Roosevelt Institute, is a member of The Nation’s editorial board.